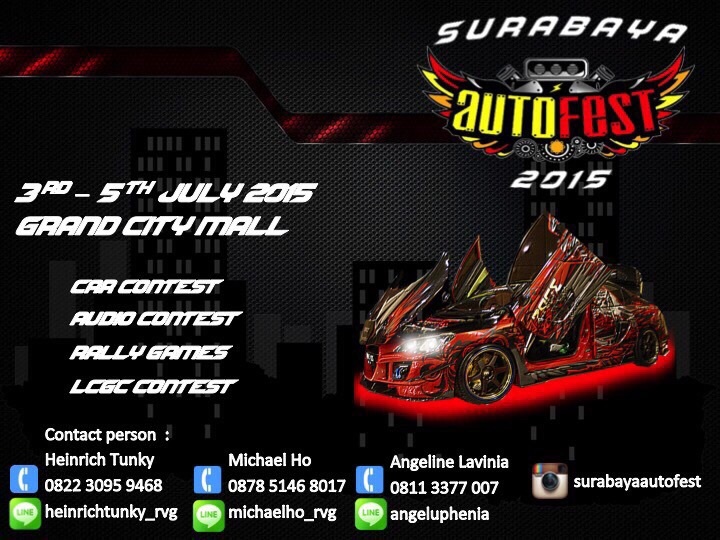 Get ready for Surabaya Autofest 2015!! Surabaya, the capital of East Java province is the largest metropolitan town in Indonesia after Jakarta. You can found (almost) everything in here, just like Jakarta, but less crowd and less stressfull traffic. It is also one of the modification barometer in Indonesia, after Jakarta and Bandung. And this year a modification contest, Surabaya Auto Fest 2015, will be held at Grand City Mall at 3rd-5th July 2015. There will be four main categories in this contest, Car Contest, Audio Contest, Rally Games and LCGC Contest. FYI, LCGC Contest is a contest which will battled LCGC (Low Cost Green Car) categories cars, such as Datsun Go/Go+ Panca, Suzuki Karimun Wagon R, Honda Brio Satya, Toyota Agya, and Daihatsu Ayla. If you interested to join the contest you can contact the PIC’s, for further information. Entri ini ditulis di Tak Berkategori dan ber-tag audio contest, car contest, modification, modification contest, rally games, surabaya pada 30 Mei 2015 oleh Rio.